The owners of this home enjoy spending time entertaining family and friends. In summer, when the days are longer and the nights warmer, they wanted to bring some of the amenities they enjoy indoors to the outdoors. 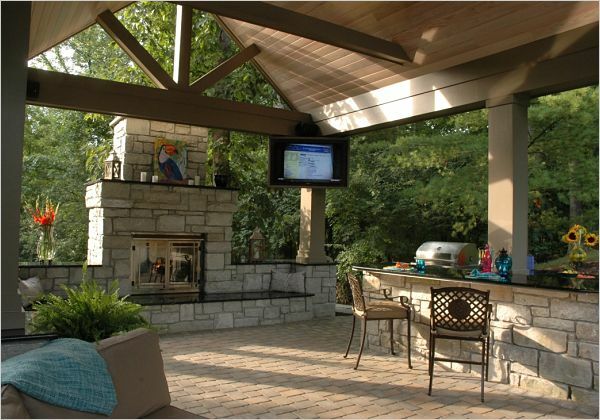 They needed a way to shelter an outdoor kitchen, bar, television, screened gas fireplace and seating area from the elements – including the sun on a hot afternoon. 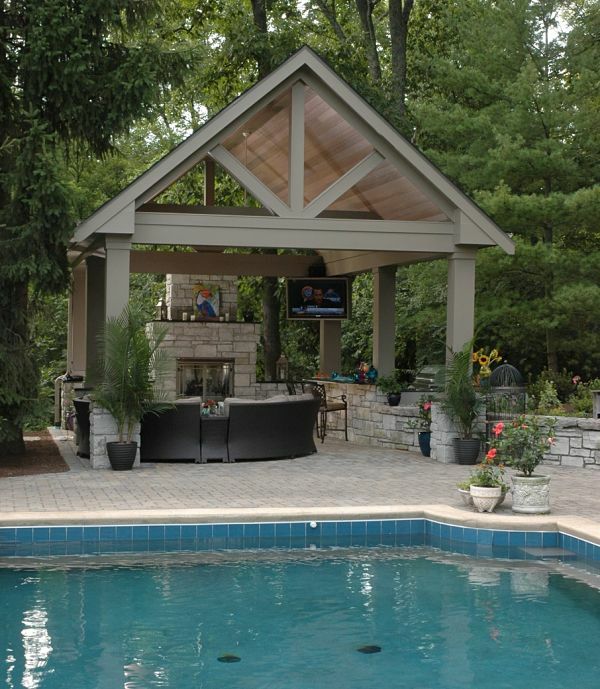 The solution was a tall, open-sided poolside pavilion. 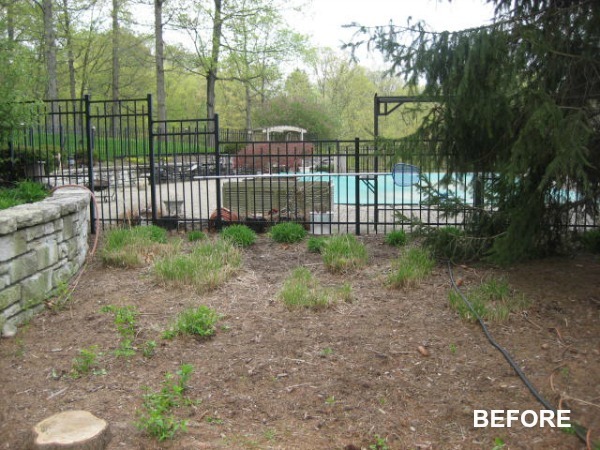 The homeowners had a beautiful backyard with a pool, patio, gardens, trees and a retaining wall. However, a section of the yard was marred with dead trees and stumps that created a gap in the landscape and an eyesore. 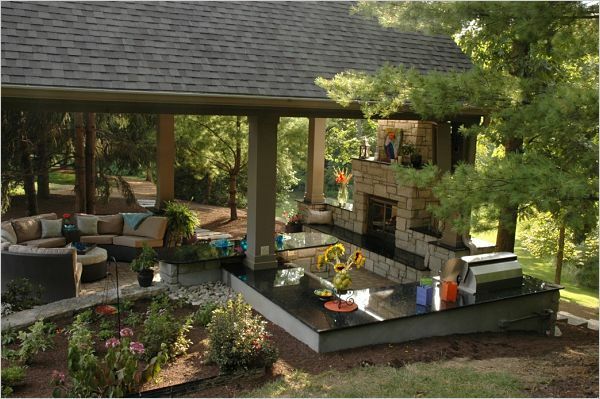 Fill the gap in the yard with a structure that would complement the landscape and augment the view from the home. Design a structure that matched the architecture of the house and position it to feel like an extension of the overall living space. 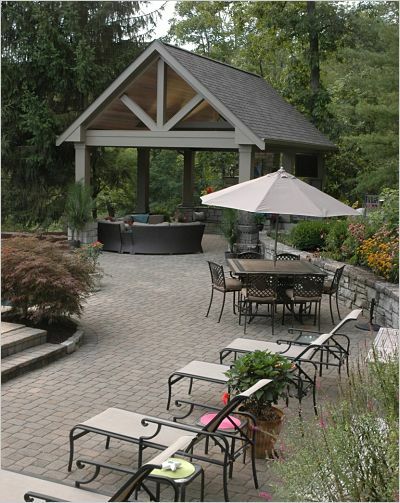 Build the structure without disturbing the existing pool, patio, trees, gardens and retaining wall. 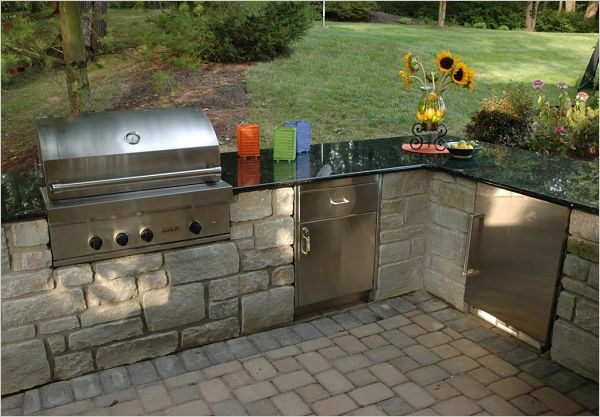 Create an outdoor kitchen with a food prep area, refrigerator, storage and a grill that would not need a ventilation hood. Include a fireplace, bar, television and seating area. Improve access to the pool filter and pump located behind the cleared area. Design a structure that would not be dwarfed by the trees and blend into the setting. 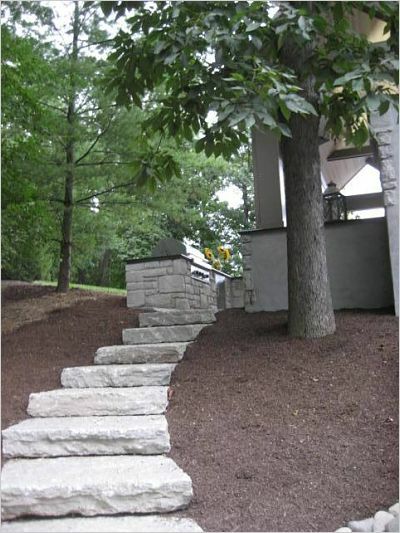 Create a design to blend in seamlessly with the existing elements in the yard. There was a patio made of pavers and a stone retaining wall. Stonework for the structure would need to match these elements. 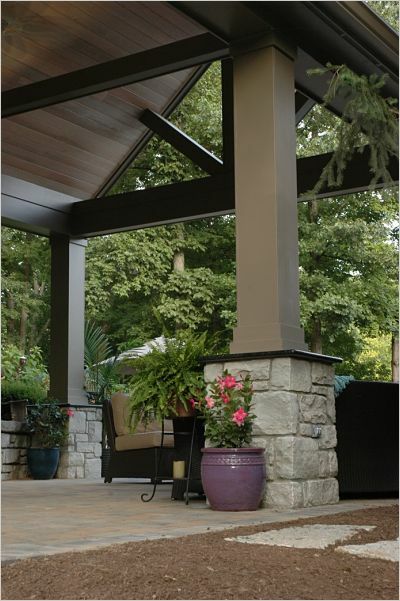 A post and beam pavilion would best meet the homeowners’ needs and objectives. The design called for integrating a bar area with the retaining wall, creating an extension of the bar for the grill, building a chimney and hearth for the fireplace and extending the patio pavers into the pavilion to create flooring. A counter for the bar and grilling area would be needed. Granite was selected for its durability outdoor and for its beauty. Granite would also be used for the fireplace hearth and mantel and to cap new sections of the retaining wall inside the pavilion. In addition to the amenities listed by the homeowner, a large ceiling fan would be added for air circulation. Paths to the pool’s mechanicals would be built behind the pavilion. 1. Preserving the view of the yard. High on the homeowners’ list of “musts” for the project was creating a structure from which people could appreciate the view of the surroundings. The structure would require unobstructed openings. 2. Excavation. 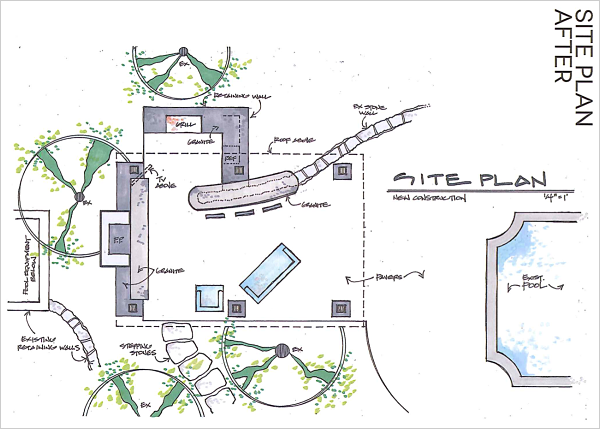 Great care would be required during the excavation phase of the project to create space for the pavilion and its features without disturbing the landscape or compromising the pool, patio, retaining wall and landscape. 3. Blending the structure with the home and yard. Stone, pavers, wood and roofing for the project would need to match products used for the house and yard. The design of the pavilion had to mirror the architecture of the house and blend with elements of the pool, patio, wall and landscape. 1. The open-sided pavilion optimizes the view. To retain as much of a view to the scenery surrounding it, the structure was designed with several open areas, including the open gable ends. In addition, the fireplace was designed to take up the least amount of space in the vertical view. A long hearth, which incorporates the end columns, and narrow mantel and chimney surround a gas insert, and use the same Indiana limestone used throughout to match the existing retaining wall stone. To eliminate the need for any type of exhaust hood, the hillside at the end of the existing retaining wall was excavated to make space for an open-air grilling kitchen. This not only provided the space for the grill, stainless steel refrigerator and custom cabinet, but also allowed for the inclusion of plenty of counter space for parties. 3. Integrating the pavilion with the home and yard. To capture the scale of the outdoors and match the tall trees surrounding the space, the structure’s support columns were built to a height of 11 feet. The roof uses the same pitch angle on the portion of the house directly across the pool, and creates a center height of 17 feet by using ridge beam construction. The existing retaining wall feeds into the pavilion blurring the line between old and new space, where it transforms into the new bar counter. A stately fireplace at the end provides a visual barrier hiding the pool equipment & preventing accidental falls from the drop off. The stonework was capped with “Emerald Pearl” granite countertops. Rather than drill into the limestone to install angle brackets, under the bar counter, the granite pieces were placed on custom- fit stainless steel panels. Five pieces of steel three inches wide and 3/8-inch thick were placed along the length of the bar counter wall, and secured in two places directly into the masonry from the top. A masonite template of the counter was used to set them three inches short of the curved counter edge for a cantilever support. Paverstone was extended into the pavilion for a seamless transition. The large TV was installed into a custom box for weather proofing and mounted high for easy viewing. The ceiling was finished with 6-inch cedar tongue and groove, and the ceiling beams include uplights. Under-counter lighting as installed for more ambient light in the pavilion. A large ceiling fan helps circulate air above. Paths off both sides of the back of the pavilion provide two access points to the pool’s mechanicals below.